Why is Tluste / Tovste special? Tovste (formerly Tluste), Ukraine, has a well-documented rich history from its days as a medieval town, with further evidence of ancient settlement dating as far back as the 9th century BC. Characterised by inter-communal (Jewish, Ukrainian, Polish ) co-existence and development over hundreds of years, until the mid-20th century. Setting of impressive architecture, historical buildings and monuments, many still visible today. Home to a museum displaying remarkable artefacts from prehistoric times; and a regional centre of educational advancement. Spiritual birthplace of the Hasidic religious movement, where the Ba'al Shem Tov — described as one of the three greatest Jewish figures of the 18th century — spent many of his formative years and revealed himself to be the “Master of the Good Name” in 1734. Rabbi Nachman of Breslov (1772-1810) whose grave in Uman, Ukraine, is visited every year by tens of thousands of pilgrims from around the world, was the great-grandson of Tluste's most notable resident. Eliot Spitzer (1959 -), former Governor of New York, whose grandfather Morris was born in Tluste in 1894 and emigrated to the United States in the 1920s. 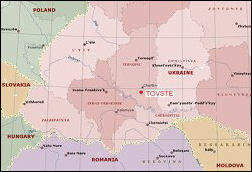 Tovste and its surrounding region are imbued with an abundant natural wealth, including mineral springs used for medicinal purposes and highly fertile agricultural land. Centrally located in relation to many other towns and sites of historic importance – including Czerwonogrod, Chernivtsi, Kamyanets-Podilskyy, Khotyn, Medzhybizh and Zalishchyky – Tovste merits inclusion on the itinerary of any visit to the region. New! The Travel Information section has been revised and updated in October 2018. Click on map to enlarge image.